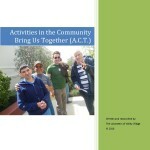 Activities in the Community Bring Us Together is a resource guide to help you plan events and outings with individuals with special needs in mind. The locations listed in this guide have been researched and vetted to have accessibility, parking and are located throughout the region. Most of the venues are free or low-cost. We hope you’ll download this and share it. The Activities in the Community Brings Us Together guide was created as part of the New Freedom grant and developed by volunteers of Valley Village. We wish to extend a special thank you to the volunteers who have worked on this project.